And then it sat in my stash. 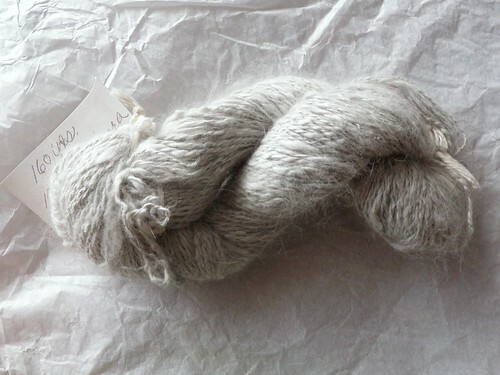 See, it’s not sock weight (nor would one probably want to make socks with handspun 100% angora!) I alternated between forgetting it existed and wondering what I would ever make with it… and then I saw Pretty Thing. 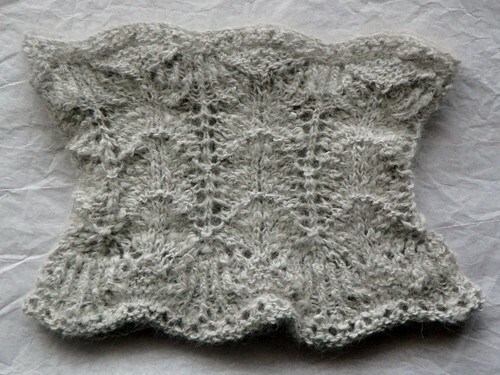 What a perfect project for a small skein of cloudlike yarn! So in August I started it. It sat (and sat). I am not very good at knitting things that aren’t socks, especially when they’re for me and have no deadline. 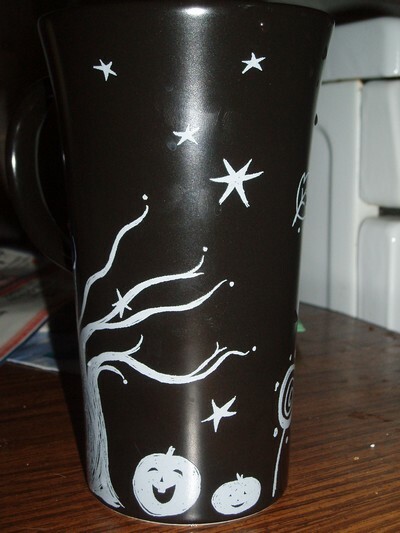 But I took it with my on my Port Townsend trip and worked on it a bit at the coffee shop there. Recently it’s been getting cold, and I’ve been wanting to finish something for that sense of accomplishment. Wednesday night I was chatting with MJ on Skype for several hours and managed to make it most of the way through. With only a few more rows left, I finished it yesterday. 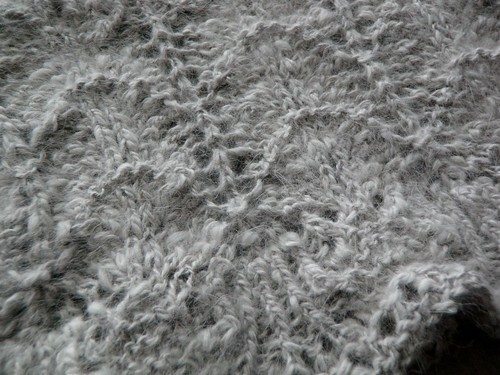 I wore it today and it is as fluffy and cozy as I ever hoped. Well, my trip to New York City, Connecticut, Rhinebeck, and Boston was awesome. Of course, I hardly took any pictures, because I am *horrible* at remembering to take pictures. 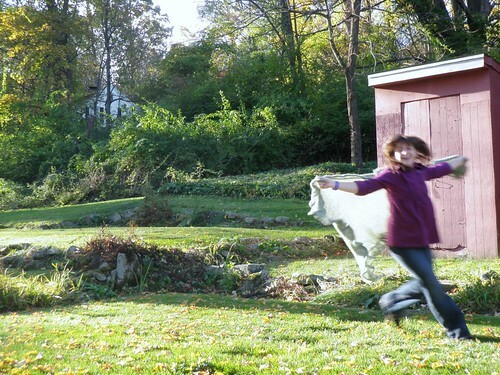 I returned home with a total of 9 pictures on my camera, and 6 of those were of my friend Rachel and her shawl. I flew into NYC on Friday evening and took the airtrain (I think that’s what it’s called) and subway into Grand Central Station. On the way I saw a woman who I can only assume was selling pirated DVDs (she was saying something that sounded like a high-pitched beeping, but I think it was D-V-D-V-D-V) and two boys who broke out their boombox and were brakedancing on the subway – except I couldn’t see them all that well because a bunch of other people were in the way. I met up with Rachel and her cousin there, we had some dinner and took the train to CT. I got to spend the night at my favorite house – Rachel’s family lives in a really really old house, I believe her dad said 230 years old. And there are all kinds of crazy things like keyholes in the floorboards and corn cobs in the walls! 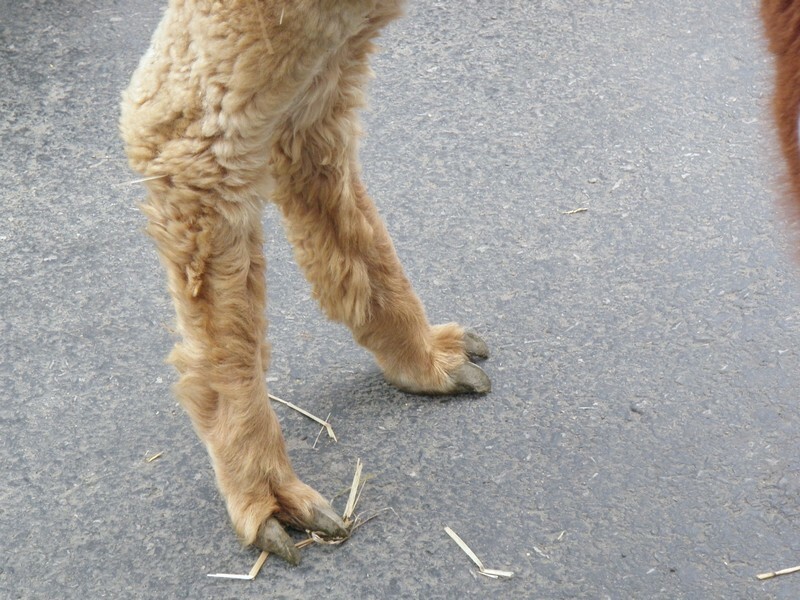 Then we headed off to Rhinebeck where we did many things, including meeting these adorable alpacas! And then, we had the opportunity to take a really cool picture. 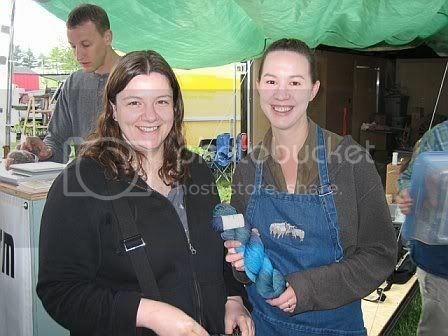 As some of you might remember, I met Rachel while we were both working at A Good Yarn in Massachusetts. Well, now we’re both in different states, but we ran into the owner of the store at Rhinebeck and got to take a picture together. Plus, look at all that knitwear! 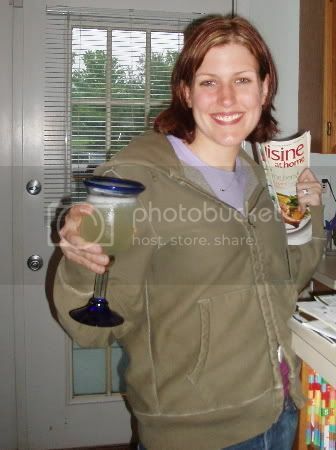 I also noticed, while looking through old posts, that the sweater I wore was supposed to be my Rhinebeck sweater last time I was there – except it was like 70 degrees. So I’m glad it finally got to serve its purpose! 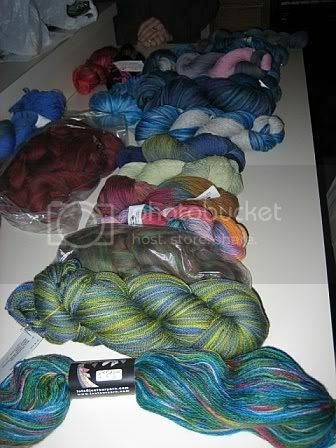 Later, more on my yarnful trip to Boston, and about 5 yarn stores in the general vicinity. On Friday Rachel and I headed to her parents’ house in CT and had a little multi-crafting evening. 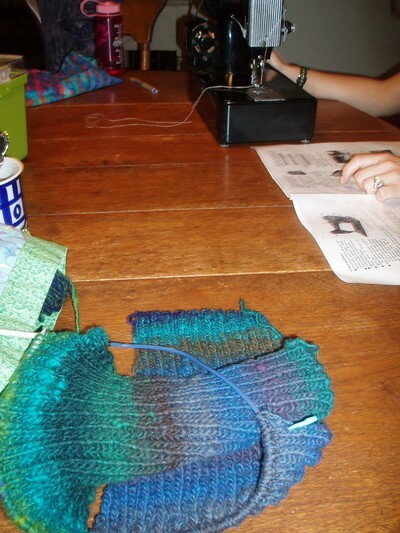 I was finishing up my Rhinebeck sweater and she was sewing a lining for her entrelac bag. However as the evening progressed and we checked the weather it became very clear that I wouldn’t be able to wear my sweater at Rhinebeck – it was going to be way too hot. Since I didn’t want a repeat of the stressed finishing of Rogue and it’s subsequent day in the trunk, I decided to give up early and knit some socks instead. 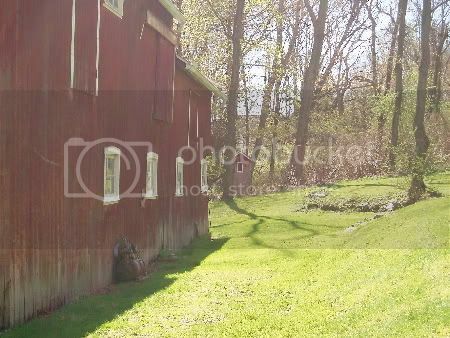 Although Friday was a day of horrible pouring rain, Saturday dawned bright, sunny, and warm as promised. I know it doesn’t *look* big, but when I get my processed fleece back it sure will be! The lovely Sarah was nice enough to help me pick out a fleece (and listen to my incessant questions while I double- and triple-checked that it was a good one) and helped me pick out a beautiful colored Romney. Actually the first fleece I looked at was a lovely CVM but it was more than I wanted both pound and price wise, so I traded in for a white Romney. Then I spent about 10 minutes in line discussing with Tania plans to buy a pound of her colored fleece so I could have it blended with mine to make it a bit heathery and finally the nice woman behind us offered this colored Romney to me. She had a few fleeces and said that if one of us wanted we could have it. I jumped at the chance and bought it, and I’m so excited to get my first fleece back. Tonight I went over to Cathy’s and took advantage of her mad sewing skills. I had the fronts and back of York done and while I know you don’t normally put a zipper in before the sleeves and collar are done… well… I’m on a Rhinebeck schedule here! I can seam the sleeves in the car if necessary, but I can’t put the zipper in without Cathy and her sewing machine. The colors are not quite accurate – a little too light and bright – because of the flash, and that black smudge at the bottom is my camera cord and not part of the sweater. I’m really enjoying the actual knitting of this sweater despite the fact that I always say I don’t like ribbing, and it’s turning out gorgeous! Quick too. 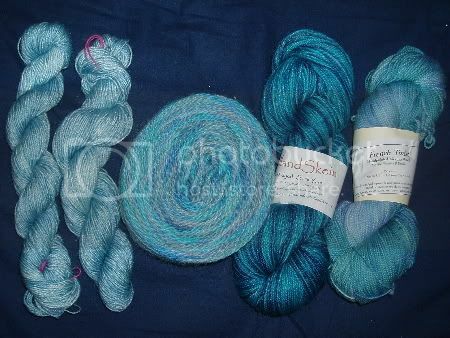 It’s funny because I’ve had multiple people comment on how “me” the colors are, but the truth is that I didn’t pick the yarn and, honestly, I probably would have picked one of the bluer Kureyon colorways. Not to say that I don’t like it, I actually am really happy with how it’s turning out and I’m glad it’s gotten me to expand my palette a little bit. 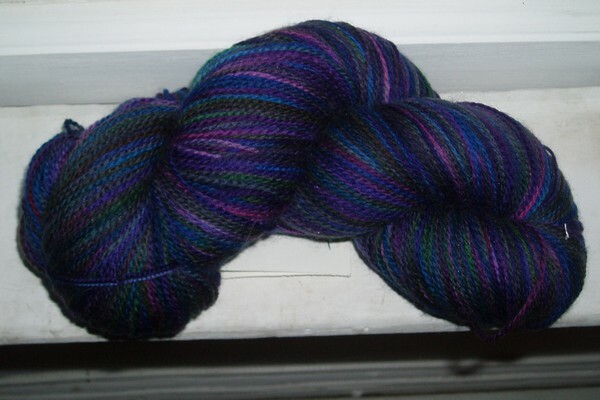 The yarn is from my friend Rachel who bought it to knit something for herself (possibly a bag?) and swapped it to me later when I mentioned that I wanted to knit York. We realized that it was enough for the sweater, plus Alexis had two more balls in the same dyelot so I’m extra safe. Now off to knit some sleeves! After that last post, I think it’s time to accentuate the positive. You know how sometimes the smallest things can make you really happy? 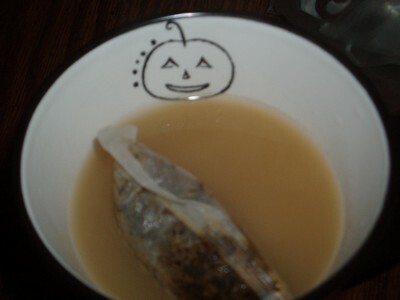 That’s how I feel about my new mug. I finished the back of my York tonight. I actually already started one of the fronts yesterday because the back wasn’t portable enough to tag along in my bag. Tonight I watched Lemony Snicket and finished the back, which had been resting needle-less on the cable. Those Denise needles sure are handy. It took almost exactly 3 balls of Kureyon. The tail you see hanging from the top is all that was left of the third ball. I hope I can finish it in time for Rhinebeck! 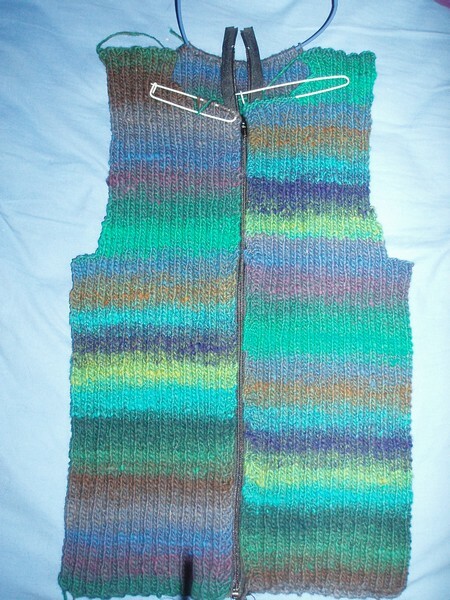 Other than my Secret Spook project(s), I’ve been working on my Rhinebeck sweater – York from Noro Knits in Kureyon 147. 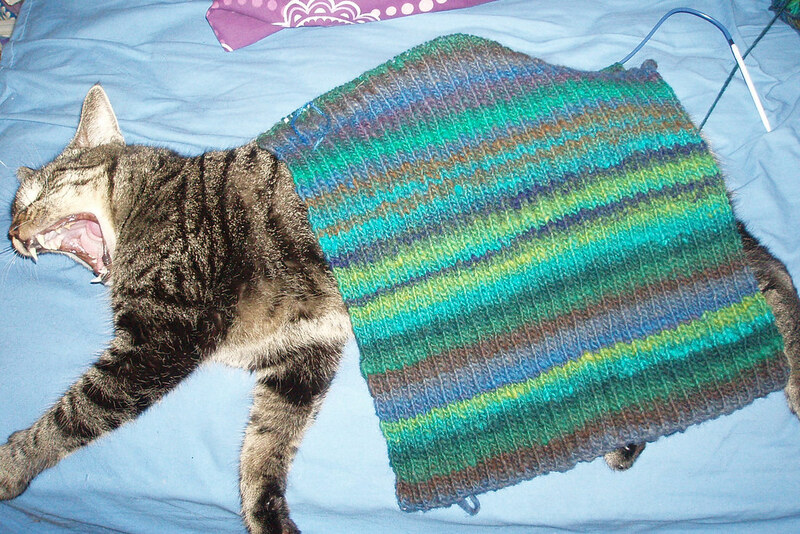 As you can see, Pan also thinks that rectangles of ribbing are really exciting. However, it’s about to get more exciting for real – tonight I started the armhole shaping. You may have noticed the odd striping sequence on the back – I decided before starting that I wasn’t going to make myself crazy by trying to match the stripes. However BOTH of the first two balls had knots roughly in the middle where a completely different color (and as you can see often an earlier color in the striping sequence) was tied on. I really don’t know what to do – I don’t want to make myself crazy so I think I’m just going to leave it and have a “That’s Noro!” kind of attitude. Socks #92 and great swap packages! Real life has been extremely busy lately, but I’ve gotten a couple of packages that I should share and finished some socks. I started these back during the Secret Solstice sock disaster, but I put them down pretty much entirely after that. I needed a simple and public knit the other day and picked them back up, and now they’re done! 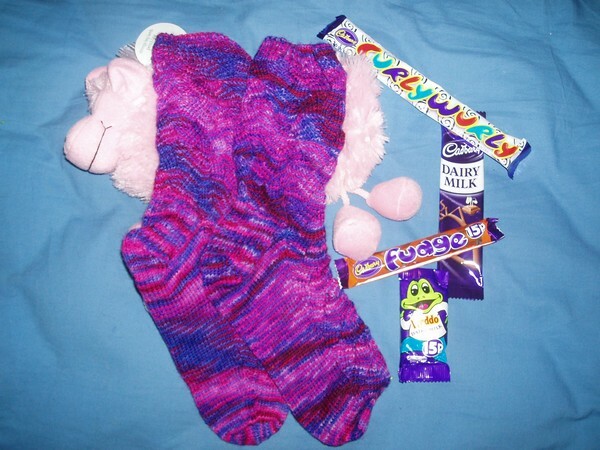 The socks are Monkeys (my first although I’ve knit some) and she sent me a cute sheepy bag and some yummy chocolate from afar. I also *almost* knit Monkeys for her, but luckily I didn’t! 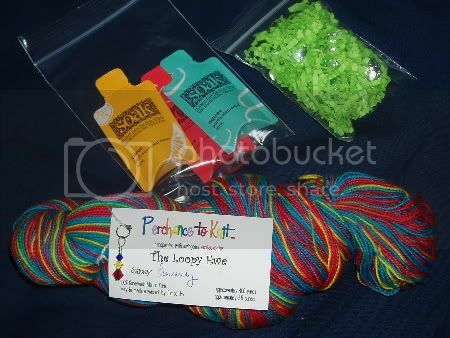 My amazing pal, Lisa, even had some Ruby Sapphire yarn custom dyed for me in my fave colors and named after me! That’s me in yarn form, alright! Thanks so much to both of my pals! 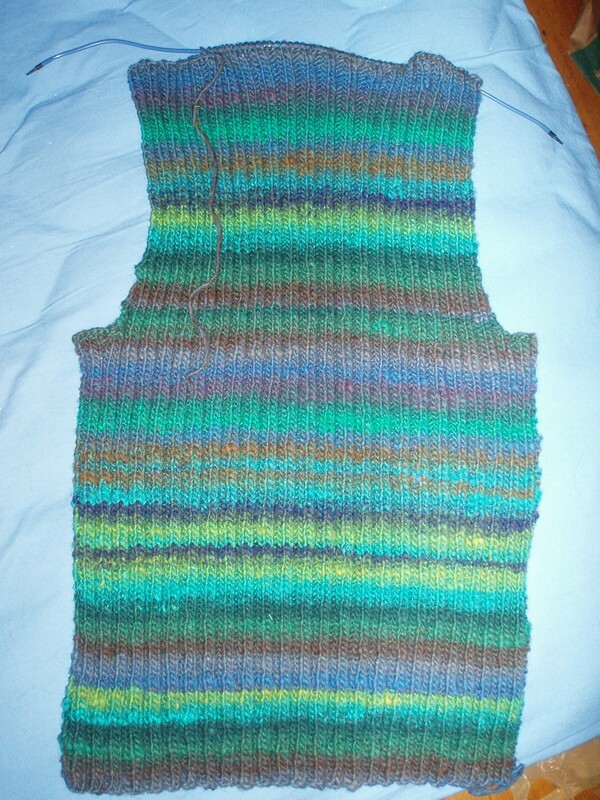 Hopefully I’ll get a little more knitting and blogging time this week – I’ve even started my Rhinebeck sweater. I woke up this morning bright and early (on a Sunday!) with Korn’s song Freak On a Leash stuck in my head. It’s an old song – I do have the new version with Amy Lee, so I’m assuming that’s why it was stuck in my head. I got the front seat and the job of navigator, there were muffins, and before too long we were there and contemplating how lucky we were that it was not freezing cold, pouring rain, and flooding like last year. Of course I brought my camera and didn’t take any pictures, although there is one of me that I have to retrieve from my co-S&Wers. Now back to the title. I had that song hopelessly stuck in my head to the point that I was actually singing it aloud (quietly) in public, the original radio edit version complete with the abrupt pause when they edit out a bad word. And then we started talking about cute little lambies and I remembered the sheep I met last year or maybe the year before – a very small pet sheep. A Sheep On a Leash. Bryghtrose was nice enough to join me in singing this new rendition of the song. 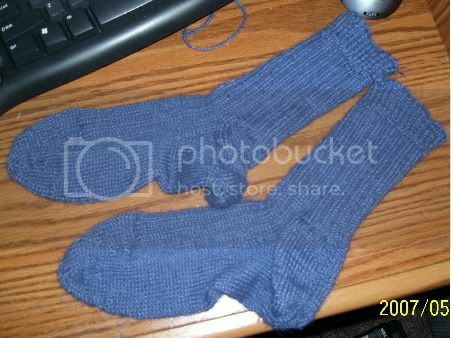 I’ve also finished two pairs of socks, as you can see in the count and progress icons. Here’s a flat picture of the blue ones – the others were a test knit so I can’t show you just yet. I knit them as written in the book. I was a little weirded out by the strange heel and toe, but I guess the recipient loves them so it’s all good. On the needles now are *two* pairs of toe-up socks – one test knit and one for a sock swap. I don’t even like toe-up socks, how did this happen? We got up bright and early Saturday morning, hit Starbucks on the way, and headed to the festival. 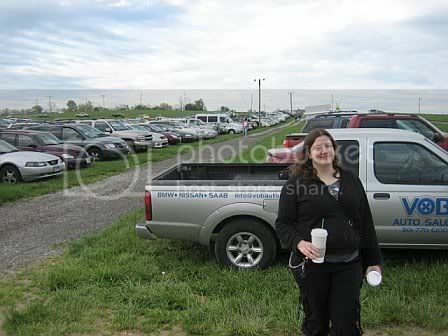 We arrived at about 8:10 (gates opened at 9) but discovered that they were already letting people in and there were lots of cars. It didn’t take me long to make my very first yarn purchase! 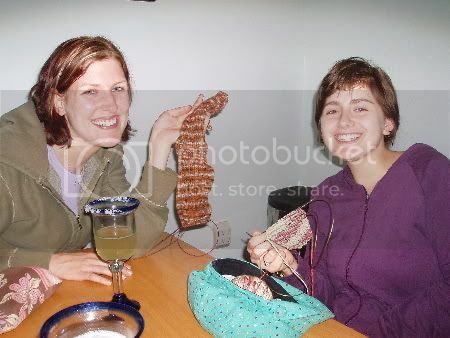 The other person in the picture is the one who dyed and named my new yarn! 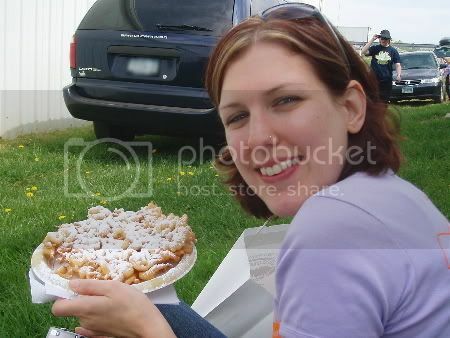 After we got through what we thought were all of the buildings we got some funnel cake and sat down in the shade of a barn to knit. At this point it was 11am and we were already almost yarned out. Rachel met up with us a little later, but headed off on her own to go through the parts of the festival we had done already. But after a little break and going to meet some Knittyheads we discovered we had missed the main building! Of course we had to stop there too, and buy a little more yarn. 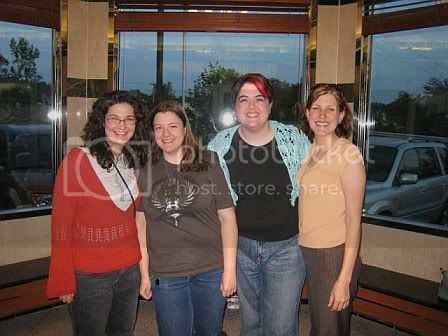 Then it was time for the blogger meetup, where I got to meet Adelle my SSS pal, along with many other great bloggers. And then tucked in for an early night preparing for the very long drive the next day. 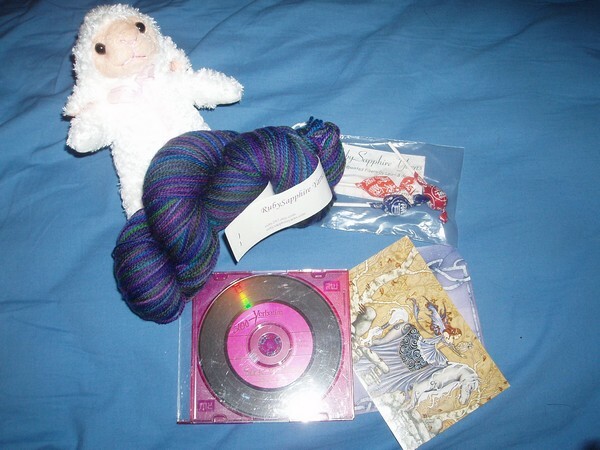 But, as for news since I came back, look at the awesome package I got for winning the Loopy Ewe blog contest! 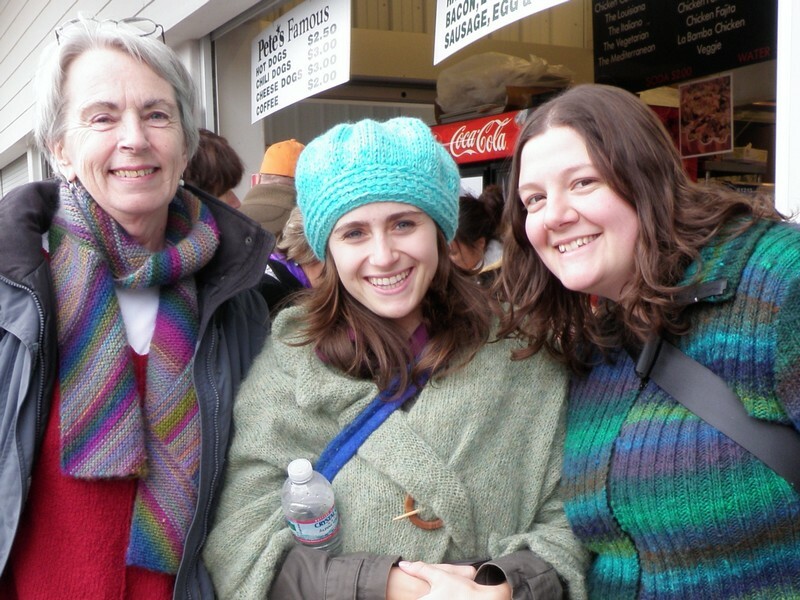 Perchance to Knit – awesome! Thanks Sheri! 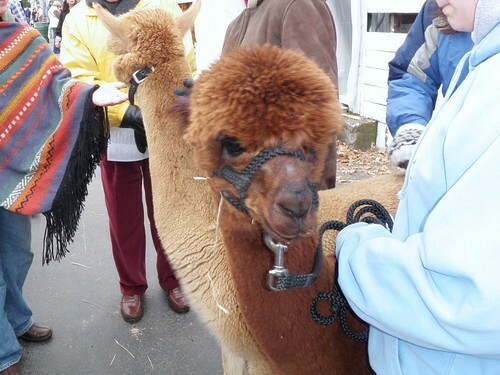 And stay tuned… this weekend I head to New Hampshire Sheep & Wool. Thursday night Rachel picked me up and we headed to her house in Connecticut to spend the night. Her family has a very old house, especially for a west coast girl like me, so I was rather fascinated with the oldness of it all. 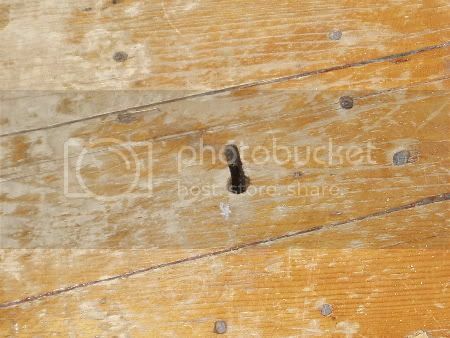 Above is the barn and outhouse, and below is a keyhole in one of the floorboards. 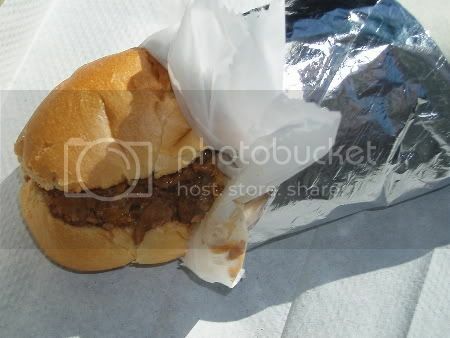 We got up Friday morning and headed down to Maryland via Philly where we stopped at Rosie’s Yarn Cellar and got lunch – I had a vegetarian cheesesteak! Rachel dropped me off at the airport to meet Amanda, and then headed into Baltimore to meet her friend. Amanda and I went to the Nautilus diner to meet Trillian and Turtlegirl for some dinner. Since I had finished socks in the car (and I didn’t bring my blockers – I’m not that crazy!) I decided to make them pose with the socks. The other patrons quite possibly thought we were totally nuts. The socks are Lichen Rib from Knitting Vintage Socks (1/24 for my goal). I’ll post more project details when I have a better picture of the socks from the recipient. We had a lovely dinner and got a group picture before heading back to Amanda’s for the night.